Jane Knodell celebrates her 2017 Town Meeting Day victory. Jane Knodell has secured her seat as Burlington City Council president — though it won't be official until Monday. The Progressive will be unopposed in her bid for a third one-year term, she said in an interview Friday. "I've heard that I have the votes of all the council members," she said. 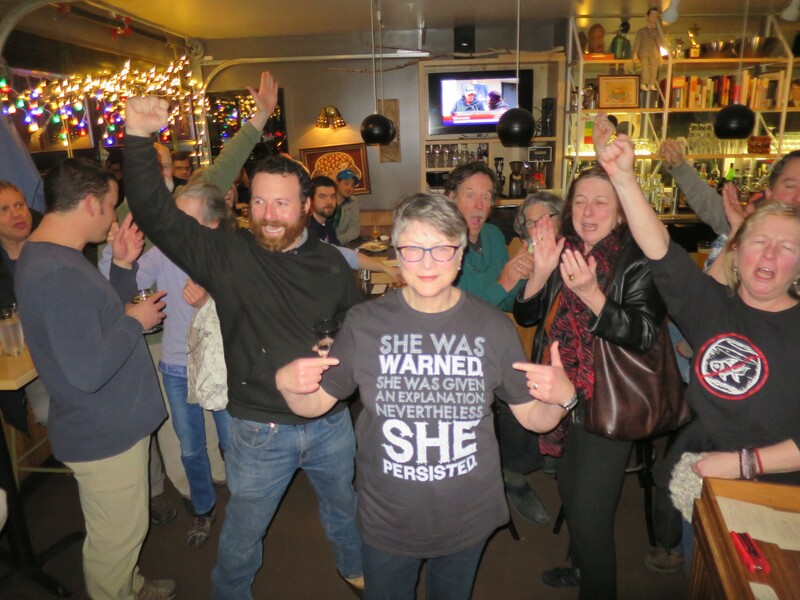 The day following Knodell's Town Meeting Day victory against independent Genese Grill in the Central District, Knodell sent out an email announcing that she would seek the council presidency, said Councilor Tom Ayres (D-Ward 7). Councilor Karen Paul (D-Ward 6) had expressed interest and was "definitely considering a run," Ayres said. In the end, Ayres said, Paul never formally announced a challenge to Knodell. Paul did not respond to request for comment. This Monday marks the council's "Organization Day," the meeting during which councilors will cast their votes for the influential Board of Finance seats and when Mayor Miro Weinberger will give his State of the City address. New council member Richard Deane (D-East District) will be sworn in, and councilors will formally vote to elect the council president, who is responsible for making committee appointments, facilitating discussion during meetings and setting council priorities. According to some councilors, that meant that the party should get another seat on the Board of Finance or retake the presidency, said Dave Hartnett (I-North District). Hartnett, for one, was behind Knodell the whole time. "When you talk about the council president, it’s gotta be someone who has strong leadership skills and can work across party lines," he said. "She has an independent streak, and that’s well respected by the councilors."